They are a natural, biodegradable product, so clean up is easy. 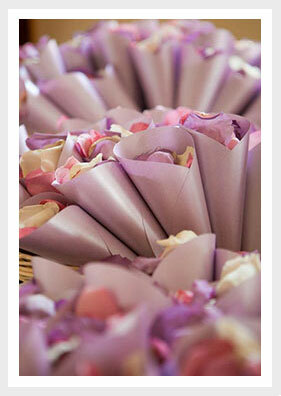 In addition, you can use them for flower girl baskets since they are much less likely to stain than fresh petals. Table decoration is another popular use, our freeze dried rose petals make an excellent conversation piece. 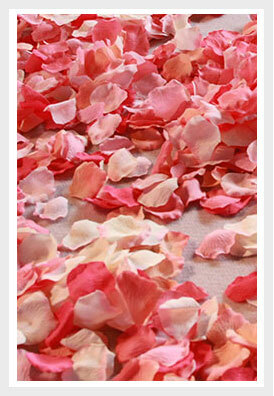 Our Silk Rose Petals are high quality petals at an excellent price. We have over 84 colors to choose from, many of which are not available in a real rose. All of our silk rose petals come in bags of 100 petals, giving you the flexibility to create your own color combinations. We also have 34 of our most popular colors available in value packs of 1000 petals for your large volume needs. Whether you are buying in bags or packs, our silk rose petals are in stock and ready to ship. Copyright © 2004 - 2013 Petal Garden Inc.